"Fostering a child in Utah leads to heartache"
This Young Adult tale mixes growing up with family ties. Set in Utah in the late 1970s, BEYOND THE GREEN shows us the world of young Britta and her extended family. Some years ago the household was made a little larger by the fostering of a baby girl whose mother had left her in a car on a cold day. Baby Dori doesn't remember any other life and she's now nearly old enough to start school. But Britta's happiness is shattered when Dori's mother wants her back. How can Britta give up her sister to an unreliable mother? The dual thread of the tale takes in deeper issues, as Dori is from a local Native tribe whose folks live on the reservation, tell different stories, sing different songs. Life troubles caused Dori's mother to drink which made her poor at caring for her child. But she claims to have cleaned up now, and the law is on her side. I enjoyed Britta showing us her busy day, chores, the barnyard rooster, her aunts and grandpa, her other sisters and brothers. She is idealistic and sometimes impractical as she comes up with schemes ranging from running away to finding a flaw in the Native woman. However, it has to be said that when accidents happen and people are in danger, our Britta turns into a heroine for real. We also see some of the neighbours and learn their stories, which demonstrates that nothing is ever one-sided. As Britta's family are Mormons, they occasionally pick up the Bible and read a helpful lesson, just as Dori's blood relatives tell useful legends about Coyote. I think anyone in middle school through young teens will learn lessons and have fun reading this family drama. The red rock countryside is well described in conversational style and characters are vividly portrayed. 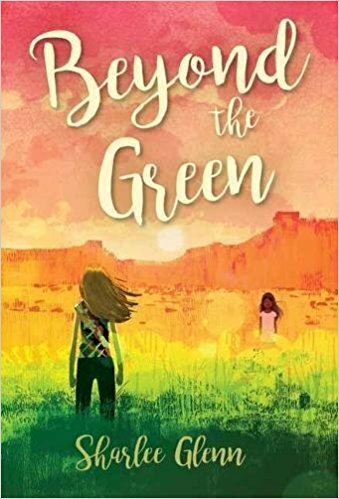 Author Sharlee Mullins Glenn tells us that BEYOND THE GREEN is a semi- biographical tale based loosely on her own fostered sister.